CLICK HERE TO VIEW OUR: LOW PRICE GUARANTEE! Let "The TTY Experts" Repair Your TTY/TDD Devices ! The Hear World Communications Service Center is one of the largest authorized TTY / TDD Repair Centers in the U.S.A.! All repairs include parts, labor, cleaning, and 90-day warranty. Hear World Communications will always inform you of the exact cost before any work is performed. No estimate fee is ever charged! 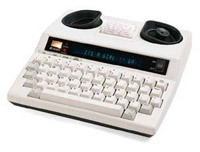 Hear World Communications carries a complete line of TTY/TDD accessories, including batteries, adapters, paper rolls, dust covers, carrying cases, etc. NOTE: When sending your TTY/TDD for repair, please include the adapter and a note stating problem description and your contact information.